Jennifer Rouse has been in the real estate industry for ten years. Her excellent communication skills and tireless commitment to hone her craft helped her to develop a vibrant career by 2008. She is very outgoing and engages completely with those who come to her for assistance in finding a new home. Jennifer loves to get her clients what they want. Her honest guidance and informed advice has created long lasting relationships with her rental clients who return to her when they're ready for a rental apartment upgrade or ready to purchase a home. She receives numerous referrals from the people she has helped. Born in New York, Jennifer attended The Fashion Institute of Technology. She has two Associate Degrees and a Bachelor of Science Degree in Marketing. She wanted to learn about investing in real estate and got her license to get a feel for the industry. She has developed knowledge of property values in New York City and its surrounding area. Jennifer always wants to add to her understanding of the N.Y.C. market. She attends as many real estate related functions as possible and takes advanced real estate courses. Combined with her heels to the pavement experience, she now recognizes a good investment for her customers. Her degree in marketing gives Jennifer an advantage when marketing an exclusive and her eye for design allows her to see the benefits of any space. She loves art and color and envisioning furniture placement to achieve the best layout possible for an apartment. Her goal is to grow an investment portfolio for herself by continuing to successfully rent and sell properties to and for her clients. We decided to move out from NY; got all to leave, so we needed to sell our home quick. We prepared the best we could and got familiar to the process; mostly said to be a nightmare. We interview 6 realtors, from there, down to 3; we explained our challenges and goals. Jennifer immediately picked up the situation and was comfortable with all the problems. No hidden agenda, no obscure ideas, no push. We signed with her and had our first business discussion; she guided us and accepted our ideas; basically, we feel like a team member was working with us. The process started fast and furious; cleaning, decluttering, pictures, papers, showings… then and there is when you get to know Jennifer; she takes the lead and let you go on with your life; in our case prepare to leave and care for our toddler and dog. She gets on the job with passion at full force but always with a smile, manners and knowledge. She went all the way to help us with everything! Created a perfect working team with the attorney and even helping with painters and people to repair what was needed. By the way, she will guide you on detail of the do’s and don’ts on adding value or not decrease it. She is a master of her trade and even helped us picking the moving company. Ask her anything related to selling and she knows it. Jennifer turned that nightmare into a gentle sail allowing us to focus on other problems. Our deal was quick and well within our expectations. Jennifer was always right on target, on time, friendly and helpful; she communicated with us constantly and kept us informed on all details and steps. We are forever grateful to her for the experience and help. She is, in a word: Professional. Really, she is a real state guardian angel. Jennifer''s expertise and professionalism are top-notch! Jennifer is an Astoria local and a property owner herself. She knows a lot about the neighborhood and is able to talk through all aspects of the process from personal and professional experience. When Jennifer does not have an answer she reaches out to the appropriate source and has the answer seemingly instantly. Jennifer is extremely responsive and willing to explain and re-explain throughout the entire process. Her clarity, knowledge and overall ability to ease the client through a complicated process makes Jennifer a great choice! Jennifer is absolutely amazing and I would NEVER use another realtor ever besides her. She truly was so available, helpful, and awesome I can''t believe I got so lucky to find her my first go around with my home purchase! Afrim Rexha and Jennifer Rouse were a great to work with. Afrim took us to many Apt. to look at and was helpful in the area they where in all where very close to what we were looking for and was able to find on that will be great for our son.. Jennifer was right on as soon as we got back so we could put a hold on the Apt. we wanted, and helped us through the whole process.. I would recommend these agents to anyone who is looking to find a apartment in the city at a great price! Jennifer was awesome to work with! (While I did not sign with her, it was of no fault of her own as I was able to renegotiate the terms of my current lease). If I had not done that I would have moved forward with the process solely with her as she, in my opinion, was the best realtor I have encountered so far in New York City. She was very straightforward, personable, and honest and she was a pleasure to work with. I would highly recommend her to anyone I know looking for any apartment. In the future, should I need to move, I will definitely be reaching out to Jennifer!! She is a rockstar. I also really appreciated the quality of apartments she sent me to look at. All of them were of exceptional quality and checked off all of the boxes on my checklist. She did a great job selecting apartments for me to view and did a great job curating the selection of listings. Jennifer was truly amazing from the first day out she had her associate Rich ready with six apartments in our discussed range. As we were viewing some, Jennifer was working on the phone getting others for Rich to show us that day. After deciding on one, Jennifer stayed with the case, answering emails quickly and addressing any problems. She not only has the knowledge and professionalism but is also down to earth with her approach. To quote her: "She Totally gets it." As a person who is very skeptical of brokers and lawyers, I found dealing with someone so professional with a "can do attitude" for her client refreshing. I would highly recommend Bond if everyone at the firm is like Jennifer. I''d like to add that this was very far from a big money deal, and Jennifer treated us with respect. Thank you. 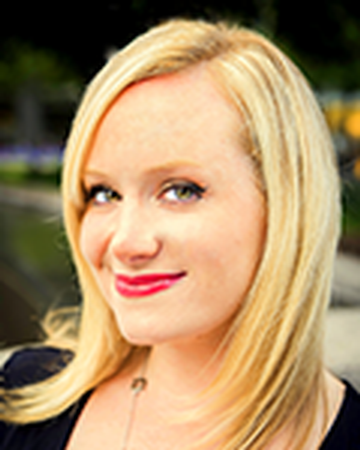 Jennifer has a fantastic personality and deep knowledge of the NYC real estate market. She and her team helped me find my apartment, and she stayed in daily contact with me during the contract, interview, and closing process. She was always responsive to my questions and available to discuss my concerns, and really kept the whole process moving with a lot of patience and enthusiasm. She also has a lot of connections with attorneys, mortgage brokers for new buyers. You definitely want an agent like this on your side, especially if you are a first-time buyer in NYC! Working with Jennifer Rouse was by far one of the best experiences I have had working with Real Estate Sales Agents in NYC. She was friendly, professional, competent and made herself very available to be reached for questions. Working with her was a great experience! 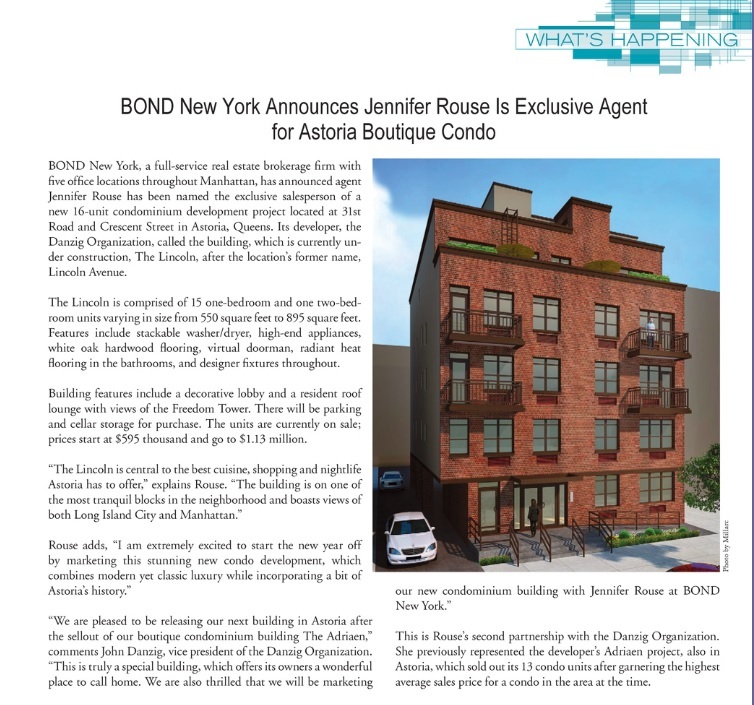 Comment for Jennifer Rouse:	Coming off a bad experience with my previous broker, I was eager to start fresh with my apartment search and happened to stumble upon the Bond New York website. I had an initial meeting with Jennifer Rouse, and I knew right away that I had made the right decision. Jennifer’s energy and enthusiasm were amazing, and immediately made me feel at ease. She told me there were a number of apartments she had in mind that she wanted me to check out. Sure enough, the very next day, I was seeing those apartments with the equally amazing Benjamin Bryant (please search his name and see my review of him). I ended up putting in an application for an Upper West Side apartment with the help of Jennifer, who was so patient and answered all my questions. In less than two hours I got approved, and was back in Jennifer’s office to sign the lease and talk about some of the specifics of the move. It truly was one of the happiest days in recent memory for me, and I owe a great deal of that to Jennifer. She made the process as smooth and seamless as possible, and I absolutely would work with her again should the need arise. I just cannot say enough good things about her! 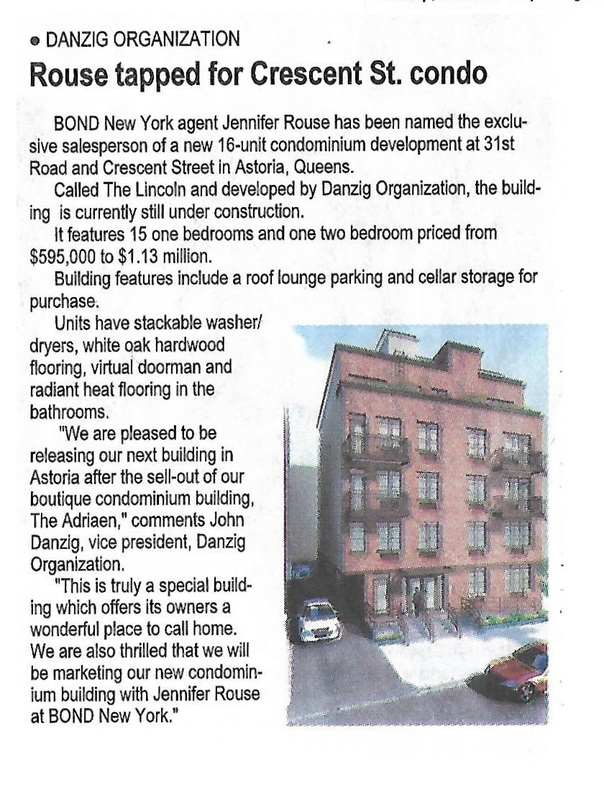 The Bond New York staff provided phenomenal service in helping my husband and me find an apartment for our daughter. First, Giovanni Santana demonstrated exemplary service in showing us at least 15 apartments in one day, due to our need to look for housing while visiting in New York for the weekend. He also very willingly continued to show several other units to our daughter as a follow-up, so she could find the “perfect” dwelling unit. He was very professional, courteous and knew the area very well. Second, we appreciated that Philip Hamilton stayed in the office late on a Saturday night to make certain our application was completed. He was also accessible by cell phone even on late evening calls for follow through with us. Third, Jennifer Rouse provided exceptional service and was constantly accessible through communications by phone, e-mail, and text messaging. 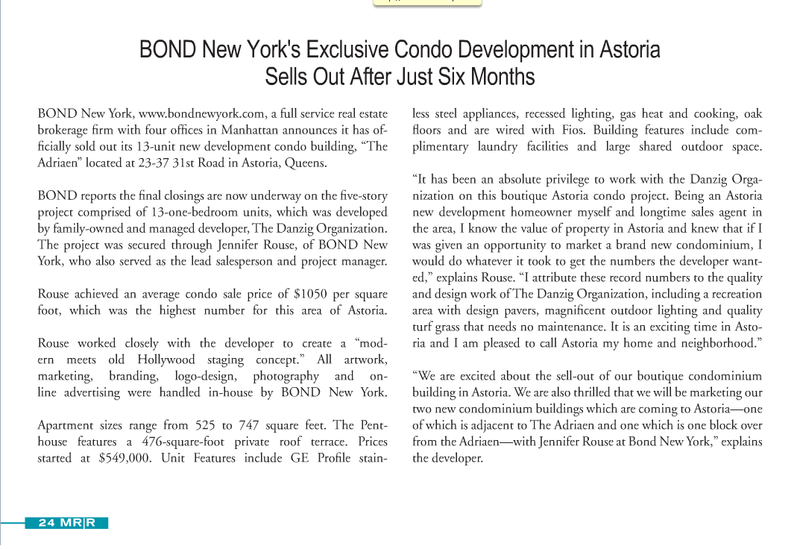 We were very indecisive, yet the staff at Bond New York were very patient in helping us make certain we had the best dwelling unit that fit our daughter’s needs. 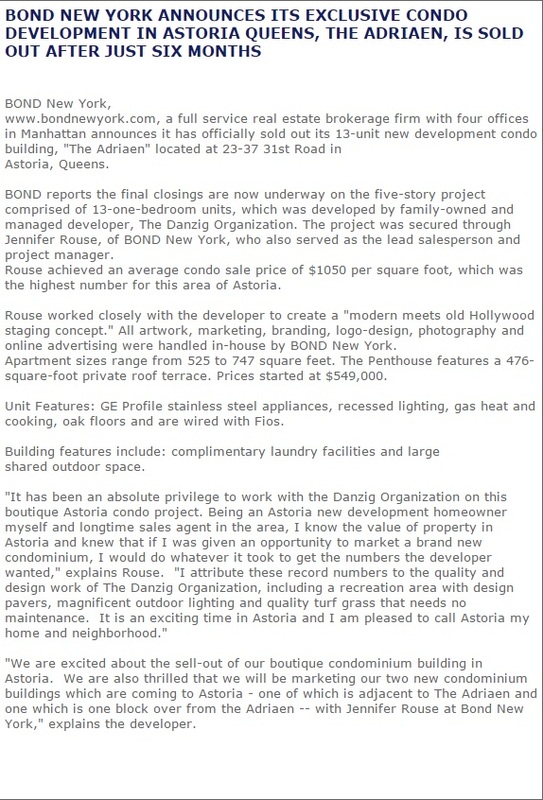 We thank Bond New York for excellent customer service; we highly recommend them to others! Afrim Rexha and Jennifer Rouse were a pleasure to work with. They were informative, detail oriented, communicative and all around helpful. I would recommend these agents to anyone who is looking to find a wonderful apartment in the city at a great price! Jennifer was amazing!! She was always on top of things and made my roommates and I very comfortable during the apartment search. She eased the stress out of the situation and made it fun for all of us! She always made herself available to meet our needs. I definitely recommend Jennifer as an agent!